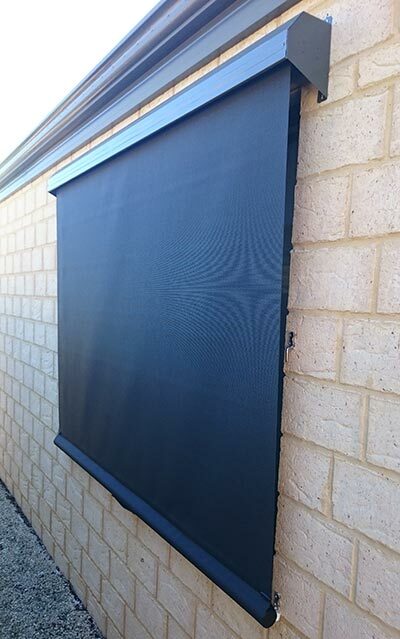 Busselton outdoor blinds are a full-on effort for a half-way result! It wasn’t that long ago that if you wanted Busselton outdoor blinds for your outdoor living area or windows, you had to choose between the blinds being raised or lowered. But with some of the versatile outdoor blinds that are now available, having blinds that are only half open (or should that be half closed?) is more than possible. This client in Busselton, Western Australia, was after retractable outdoor blinds for their windows that would stop half way. They called Vanessa and Ben O’Callaghan from Outdoor Concepts in Busselton and with help from renowned supplier Pinz, their blinds are now a reality. Vanessa and Ben chose Pinz’ PNP Sunshade to meet the requirements. These spring operated retractable blinds are extremely versatile, in that they can be fitted to many structures that normal outdoor blinds can’t. Plus, it’s possible to install two or even more stainless steel fixing locations, to allow the blinds to be lowered to exactly the position wanted. Which all means for these Busselton homeowners they can enjoy as much or as little of the sun as they want – thanks to their Busselton outdoor blinds!